A new car for the Southworth fleet, a photo by Southworth Sailor on Flickr. It's been twelve years since I purchased my used Toyota pickup, and fourteen years since we purchased our new Toyota Sienna van. Neither vehicle is showing signs of death despite 265k on the van and 225k on the truck. Both still have valuable utility in our lives, but we wanted something with better gas mileage. I have long wanted something a little sportier than a truck and a van, and have been known to enjoy 'borrowing' my sons' cars, so that I can drive a stick shift. After a couple of months of searching the Puget Sound and beyond (five trips to Bellevue, three trips to Lynnwood and a trip to Portland), we think that we found a car with which we are both happy. As could be expected, I was pushing the midlife sports car button and Esther was turning the practical and comfort knobs. 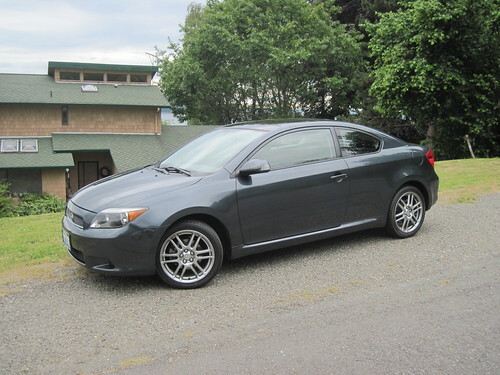 The Scion tC seemed to meet both of our requirements. The one we settled on is a 2005 with 105k in great condition. If this Toyota serves as well as the last two, it will be with us for at least a decade.